Moving at the Speed of Creativity | Vimeo or YouTube? Where to Post Family Videos? Vimeo or YouTube? Where to Post Family Videos? A family friend and member of our church has a middle school-aged son who is getting to be quite a videographer. I have taught him for two years in Sunday School, and have glimpsed on a few occasions some of the films he’s created with his friends. (Reminds me in a positive way of Super 8, actually.) I created the following seventeen minute video and screencast to answer the question for their family, “Where should we post our son’s videos online if we want to limit access to them?” My short answer for their situation (wanting to password protect videos that are longer than 15 minutes long) is Vimeo.com. Here’s the entire video, in case this is information that can help you or someone else you know. What are your thoughts? Do you have a different recommendation for someone in this situation? Access our family learning blog, “Learning Signs,” on learningsigns.speedofcreativity.org. 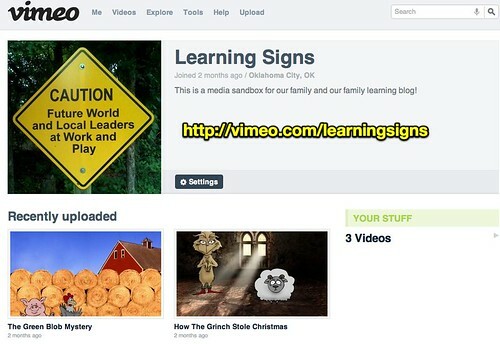 In addition to the Vimeo channel for this site (vimeo.com/learningsigns) I’ve been using a free Vimeo channel (vimeo.com/blastcast) for the 5th/6th grade Sunday School classes I’ve taught the past four years. YouTube (youtube.com/wfryer) continues to be my primary channel for personal and professional video sharing, but as I discuss in this video it has some limitations which can make Vimeo a better choice for certain circumstances. One Response to Vimeo or YouTube? Where to Post Family Videos?